Even though there may not be quantifiable statistics that prove that yoga prevents recidivism, our purpose is to infiltrate and claim as much spiritual real estate as possible. We teach yoga to incarcerated women because we believe yoga can help them go on to experience the full expression of their lives. 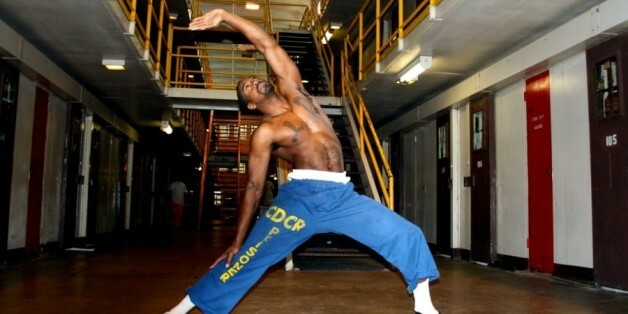 Teaching yoga in jail isn't just about giving the women exercise, it's about giving them tools to cope. That's why I always start with the hope that Tadasana brings. This is an interview with Perri van Rossem, who began teaching yoga as a volunteer in 2005 at Collins Bay Medium Security Institution in Kingston, Ontario; she has been teaching there ever since. In addition, she coordinates yoga programs being offered in three other institutions. I met Mike Huggins a year ago at the Sedona Yoga Festival, over dinner, and heard some of his story; you will read the rest below. He started practicing yoga 12 years ago to help deal with chronic back pain. This is an interview with Sara K. Schneider, who wrote about law enforcement in her book, "Art of Darkness: Ingenious Performances by Undercover Operatives, Con Men, and Others." HuffPost's Third Metric seeks to redefine success beyond money and power. As part of our ongoing series, we discuss how to help prisoners practice mindfulness and find well-being when they're serving time behind bars. They were freedom yogis, practicing to find liberation behind bars. Imagine how confronting and challenging -- and how meaningful and transformative -- it would be to show up to your yoga mat every day if you were in jail for life.